Bowl season is kind of like a vacation. At the beginning, you're so excited for it that the smallest morsel makes you so excited. Then it actually gets going and you start thinking, hey, this doesn't feel like how I thought it would be. In the middle you start realizing that it's actually gone pretty good despite your initial fears and you're having a real good time. And towards the end you're savoring every moment and looking forward to the next one. Remember when they added the “plus-one” game and that was supposed to be “completely different?” Yeah, how'd that work out? It just meant two more teams got to go to a fancy bowl. 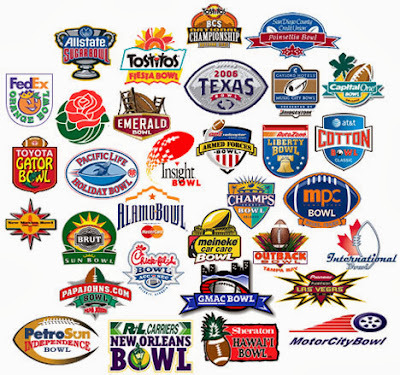 This year there are 35 bowls and as a result, 70 bowl teams. How is having a four-team playoff going to make postseason life any different for a 6-6 Oregon State team or an 11-1 Northern Illinois team that loses at the worst possible time? Answer: it won't. Unless you're part of that four-team playoff, life ain't changing. And I know this is like comparing apples and oranges, but this is where the NCAA basketball tournament is still miles better than anything football can come up with. All 68 teams playing in March have, in theory, a chance to win a national championship. All of them. And the little teams, even though they really have no feasible chance to win it all, can still alter the path for somebody else. Like when a 9 seed upsets a one seed in round two. Or one of those “First Four” teams, like VCU or Davidson, makes a run to the Elite Eight or Final Four, knocking off a potential title team (or two. Or three.) and changing who actually wins the title. So they can shove “this will be different” storyline at us how many ways they like, it won't be different... until the smaller bowls start losing enough money that they start folding up shop. Then- and only then- will it start getting closer to the way the NFL gets a championship, and less of how college has crowned a champion. Not that the NFL hasn't tried. During the 1960's the NFL had, and I swear to you this is true, a “Third Place Game” (officially called the Bert Bell Benefit Bowl) for the losers of conference championship games. Pre-merger, when the NFL had four divisions, the two division losers played in this game, meaning that for a few years somebody's playoff record could be 0-2, which is amazing. When the AFL-NFL merger happened, the game continued for a few years on the bye week before the Super Bowl. But the inevitable lack of interest- by both fans and players- caused the game to be eliminated. (The NFL has also changed it's playoff history, and the “Third Place Game” is now treated as an exhibition footnote, not an actual playoff game.) Imagine if last year the Atlanta Falcons and New England Patriots played in the Losers Bowl in the bye week before the Super Bowl. Would fans spend money to go see that game? Hell no! That's what I see happening eventually to some of the smaller college bowls... and we will all be better off because of it. Then, and only then, will we know the playoff is working. That would be a good thing, because for now, nothing that college football has tried has worked. When the BCS started in 1994- and remember, it wasn't the BCS as we know it, it was the “Bowl Alliance” because the Pac-10 and Big 10 refused to join because the Easterners wanted to tear up the Rose Bowl and put whoever they wanted in it. In the final year of the Bowl Alliance, 1997, Michigan finished undefeated after a win over Washington State (and Ryan Leaf) in the Rose Bowl and won the AP national title, and Nebraska beat Tennessee in the Orange Bowl/Alliance Championship game to win the other polls. So that clearly didn't solve any problems. The Pac-10 and Big 10 only joined to make it the BCS with the promise that the Rose Bowl would remain intact, unless one of those teams was ranked one or two and was playing for the national title. Then, the first time the Rose Bowl hosted the title game (this is before the plus-one, so it was the only Rose Bowl of the year), Oregon, the Pac-10 champ, was ranked number two in nearly every poll at the end of the regular season... but the human polls were not part of whatever convoluted system they were using to calculate who played in the title game, so Oregon got passed over. And Colorado waxed Nebraska to win the Big-12 North and then won the Big-12 title game to finish third in the regular season... but Nebraska, who was ranked fourth in the polls but number two in that bizarro system, got the nod to play Miami in the national title game... and got pasted, again, as everyone knew would happen. So that clearly didn't solve any problems. That this happened in Florida only kinda ticked a few people off. 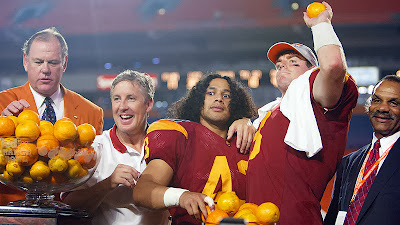 The Pac-10 and Big-10 kept threatening to pull out of the BCS because it was obviously fatally flawed and they didn't want the Rose Bowl to be a joke, like it was that year- and the next, when USC and Iowa played in.... the Orange Bowl? And the next, when there were three one-loss teams, and USC was the team that got left out in the cold (that was the last time the polls had split national champions). I am convinced after those issues, (and more) the Pac-10 and Big 10 were going to leave the BCS. The Rose Bowl makes more money than all the other bowls including the BCS Title game, so it's not like they were worried about cash or interest in the game. So that's why the plus-one was finally put into place. That was supposed to solve all the college football problems. Remember in 2011, when the plus-one featured LSU and Alabama, two teams from the same division in the SEC? You tell me if it worked. Not long after that uproar, the Pac-12 and Big 10 announced an agreement to play more non-conference football games against each other. To me, that was a clear indication that those two conferences were done with it and were actually going to pull out of the BCS, and maybe even the NCAA itself. It seems quite interesting to me that not long after the conferences announced they were scrapping that idea, the four-team football playoff was announced. So now there's a new four-team playoff, and that's supposed to solve all the college football problems. I think we've seen enough BCS ideas to know how much that's going to work. I don't really have a solution aside from an eight team playoff, because in college football there's a clear delineation line between the haves and the sort-ofs and the nots. The NFL is a 12 team playoff, and that makes sense because the pros are the best of the best. A six-seed in the NFC can win the Super Bowl- and the Packers did just that a couple years ago. The 12th best team in college football this year is Oklahoma, who nobody in their right mind would put in a playoff, and nobody thinks they got a Sugar Bowl berth because of merit. If it was based on merit, the 10th-ranked Oregon Ducks would be in a BCS game and the 15th ranked UCF Knights would not. The Knights are in because they won the “AAC,” aka the leftovers of the Big East, aka a conference that only has an automatic BCS bid because their basketball teams are still decent. As it is, the Ducks are in the Alamo Bowl and the Knights are in the Fiesta Bowl. And that's why this is a bowl preview preview column. I'll be doing previews of every single bowl game, and hopefully I will be joined by some very good friends of mine, Bob of Arabia and Wailin of the Air. Bob, Wailin, and I had a website a while back called “3 Sports Monkeys,” because there were three of us and it seemed clever enough at the time. We did bowl previews and had special categories like “wait, aren't these teams in the same conference?” and “games involving teams I don't remember hearing even existed.” It'll be thrilling. My favorite part was refusing to use sponsor names for the bowls and having to search on Wikipedia for the original pre-sponsor name. The problem was, some of the sponsor names have completely taken over, so nobody remembers- the pre-sponsor name. As an example, I'll give you two questions, and please, no cheating by using the internet. (Even though you're now on it.) 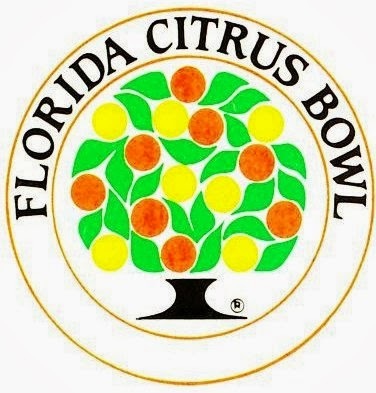 One: What's the Citrus Bowl called nowadays? 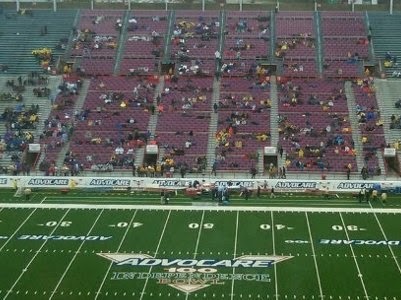 Two: what was the pre-sponsor name of the Capital One Bowl? You're scouring your brain now. This may make you somewhat angry, because you, like me, remember watching the Citrus Bowl as a kid and wanting to spend New Year's Day in Florida. You also may have, just like me, forgotten that the Capital One Bowl is in itself an advertisement and not a real name. For me, this is like the NASCAR Winston Cup. I didn't realize it was named after cigarettes, I just thought it was actually called the Winston Cup- you know, there was a real good racer named Winston or something, like the Lombardi Trophy- until Sprint took over sponsorship. People complained that the Winston Cup promoted cigarette smoking. Well hell, I was their target audience (even though I was not and never have been a smoker) and I had no idea they were sponsoring auto racing. So there went those advertising dollars. So, you ready for the answers? They're the same bowl. (The name change happened in 2002.) You're welcome. Bowl games start December 21, Bowl Previews start... sometime before that. In the meantime, don't believe that things are going to change at bowl season. Footnote to the Playoff Bowl: The Detroit Lions won it three times. I mean, damn.